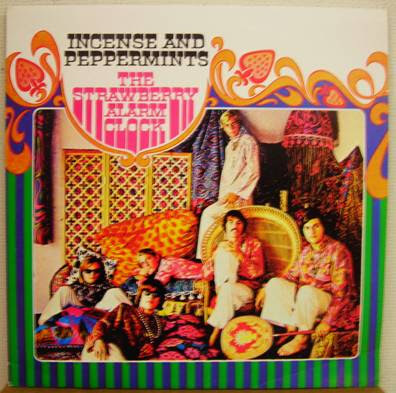 Rounding out The Top Ten, the momentum seems to have stalled in the Top Five positions … last week's #1 Record, "Soul Man" by Sam and Dave, slips to #2, "To Sir With Love" by Lulu drops from #2 to #3 and "The Rain, The Park And Other Things" by The Cowsills and "It Must Be Him" by Vikki Carr" hold steady at their previous week's positions of #4 and #5 respectively. "Please Love Me Forever" by Bobby Vinton is the only Top Ten hold-over showing upward movement this week … it climbs from #8 to #6. New entries in The Top Ten for the very first time include "Let It Out" by The Hombres (up from #12 to #8) and "I Can See For Miles" by The Who, which makes the biggest leap of the nation's ten biggest hits, climbing from #17 to #9. Top 20 Records earning a bullet include "It's You That I Need" by The Temptations (#16 to #11), "I Say A Little Prayer" by Dionne Warwick (#24 to #13), "Everlasting Love" by Robert Knight (#20 to #14), "Kentucky Woman" by Neil Diamond (#21 to #17), "Pata Pata" by Miriam Makeba (#25 to #18) and "Like An Old Time Movie" by Scott McKenzie (#28 to #20). 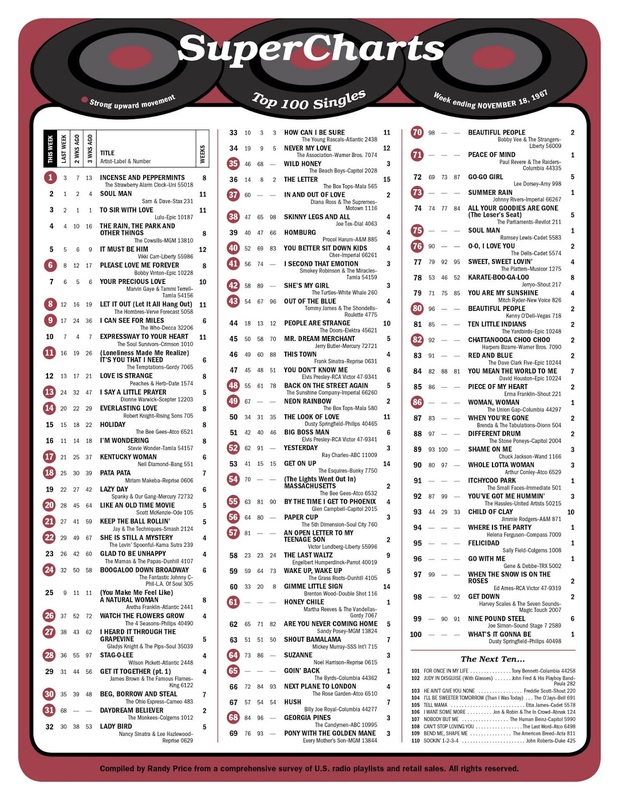 Elsewhere in The Top 40 we find "Keep The Ball Rollin'" by Jay and the Techniques climbing from #27 to #21, "She Is Still A Mystery" by The Lovin' Spoonful, up from #29 to #22, "Boogaloo Down Broadway" by The Fantastic Johnny C up from #32 to #24, "Watch The Flowers Grow" by The Four Seasons, climbing eleven places from #37 to #26, as does "I Heard It Through The Grapevine" by Gladys Knight and the Pips (right behind it, climbing from #38 to #27), "Stag-O-Lee" by Wilson Pickett (#36 to #28), "Beg Borrow And Steal" by The Ohio Express (#35 to #30), "Wild Honey" by The Beach Boys (#46 to #35), "In And Out Of Love" by Diana Ross and the Supremes (#60 to #37), "Skinny Legs And All" by Joe Tex (#47 to #38) and "You Better Sit Down Kids" by Cher (#52 to #40). But the biggest mover of all this week belongs to The Monkees, who sky-rocket from #68 to #31 with their latest, "Daydream Believer". Looks like another smash hit for The Pre-Fab Four! 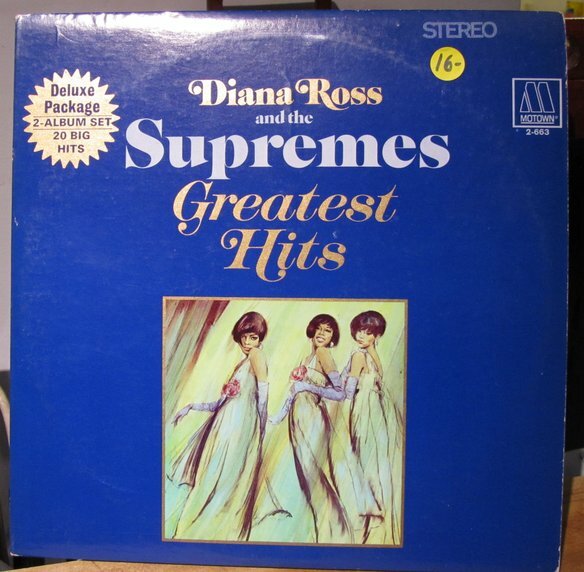 Diana Ross and the Supremes Greatest Hits holds at #1 on the Album Chart for the fourth straight week. Actor Steve Zahn is born. There is music in his future when he joins The Wonders decades later for the Tom Hanks film "That Thing You Do"